This post is filed under Broccoli, Carrots, Chicken, Corn, Frozen, Hall of Fame (Looks), Microwave, Reader Submission, Rice, Stovetop, Wanchai Ferry. We buy this in the Garlic Chicken flavor quite often. The Garlic Chicken is spicy, delicious, and amazing! Quality is very high. 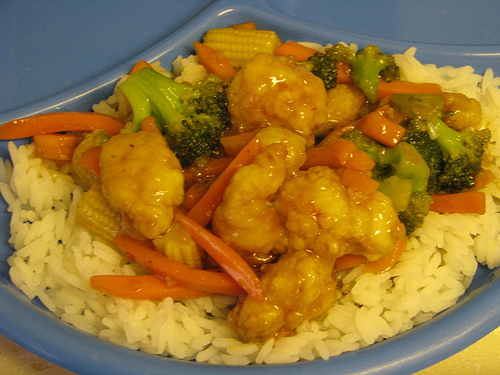 The portion is on the small side, however, we cook some extra rice, and then we are satisfied. The sodium level in this is extremely high, if that is something you have to watch out for. But sodium is high in most processed foods. By the way, I enjoy your blog, and I get quite bummed when you skip days! these are good, but you don’t get much food. if i make one of these for my boyfriend and i we have to fix something extra or we’re left hungry. the walmart commercials where they make it seem like you can feed a family of 4 on one of these is really deceiving. unless your family is satisfied with 3 bites of chicken you might want to get an extra bag. As far as value and portions, one is probably better off getting the non-frozen version of this same product. The only difference is that it comes in a box and you must provide the vegetables and chicken separately, just like with Hamburger Helper. 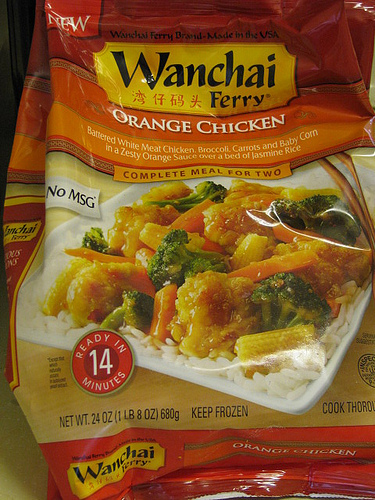 I made the boxed version of the Wanchai Ferry Orange Chicken with 1 lb of boneless chicken breast just the week before last and I had enough leftovers for three days. You’re in luck; there will be new updates Monday through Friday through at least next week. I think that the Walmart commercial shows two bags.